I had no idea what to expect from In Memoriam because Brent Abell and I exchanged stories on a whim. What I received is a novella full of despair, death, gore and manifestations. Does Abell’s debut novella etch itself into memory, or does it fade away like the ghosts of the past? I enjoyed the emotional and physical torture that Andi was put through. The book begins with Andi making a very difficult decision, one that she hopes will keep her boyfriend Chris happy. Even before the supernatural elements take over, there is a very real element of human danger that threatens her. One key success in character building is that Andi is a strong female lead, but she is not without flaws. This balance is something that I applaud Abell for, because Andi feels like a complete person. It’s easy to care about her, even if for a portion of the book, I disliked her. Chris is a fine supporting player whose role shifts somewhat between co-protagonist and antagonist. He isn’t as fully developed as Andi as a character, but he doesn’t need to be as he spends a good deal of time in the background. Except for very specific points, the story flows at a frenetic pace. The supernatural elements are key to the pacing, and Abell shows a deft hand at crafting verbiage that locks the reader in while increasing their heart rate. Brent Abell is quietly amassing a list of publishing credits while he crafts his novel, which was only ever to be a novella. Abell is quite comfortable creeping people out with a smaller word count, as In Memoriam so effortlessly portrays. To pick up your copy, click here. To learn more about Brent, visit his website. This entry was posted in Novellas and tagged Brent Abell, In Memoriam, Supernatural by We ain't here anymore. Bookmark the permalink. 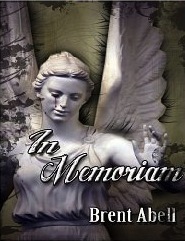 “In Memoriam” by Brent Abell reviewed! My DT review of Brent Abell’s debut novella. The first review for “In Memoriam” is in and it looks pretty good.